At Acklam Car Centre quality and affordability are the watchwords, based on a foundation of excellent customer service. The team at Acklam Car Centre have a reputation for understanding and meeting the needs of each individual customer, offering a service that is reliable and consistent and treating each customer with courtesy and respect. A family business, Acklam Car Centre specialises in performance cars, 4x4s and prestige vehicles, sourcing those quality used cars that offer the right combination of luxury and affordability. Each member of the team is knowledgeable about every vehicle in the showroom and is on hand to talk the customer through what they want and what each car has to offer in order to match the customer to the car that best meets their needs. Here, Acklam Car Centre reviews the Audi R8 Spyder 4.2 V8 Quattro, a stylish model that the team are always on the lookout for to enhance the showroom. The Audi R8 Spyder was originally fitted with a 5.2l engine as standard. The 4.2l engine became available in July 2011. A two-seater, mid-engine sports car, this vehicle uses the trademark Audi Quattro permanent all-wheel drive system, can go from 0-100km/h in 4.8 seconds and has a top speed of 299km/h. It boasts 317lb ft of torque, 424bhp and revs up to 8500rpm. The structure features the all-aluminium Audi Space Frame, meaning that the superstructure rather than the panels hold the strength, resulting in a soft-top car that is exceptionally rigid. This sporty little number has left testers astonished at the outstanding handling. Despite lacking the V10’s dual setting magnetic dampers, the V8 is supple and reactive with absorbing dynamics. Lighter than the V10 by a whole 60kg, the steering may not quite be as sharp, but the overall balance is much better, most noticeably when tacking into a corner. Those who have driven the V8 have used words such as ‘characterful’, ‘smooth’ and ‘exciting’ when describing the engine and Acklam Car Centre certainly agrees. The most recent addition of the R8 to the Acklam Car Centre showroom was a prime specimen from 2011 with only just over 20,000 miles on the clock. This car comes with a six-speed manual gear box, on board trip computer, cruise control, central locking, Bluetooth technology with dual SD card slots and full stereo system, heated electric seats on both the driver and passenger side, automatic climate control, electric windows and heated mirrors, voice activation commands, sports suspension, leather upholstery and a whole host of other luxuries and accessories as standard. The optional extra specification package includes satellite navigation plus, high beam assist, light package, the Audi music interface, coloured stitching and an acoustic parking system to the front and rear of the vehicle. 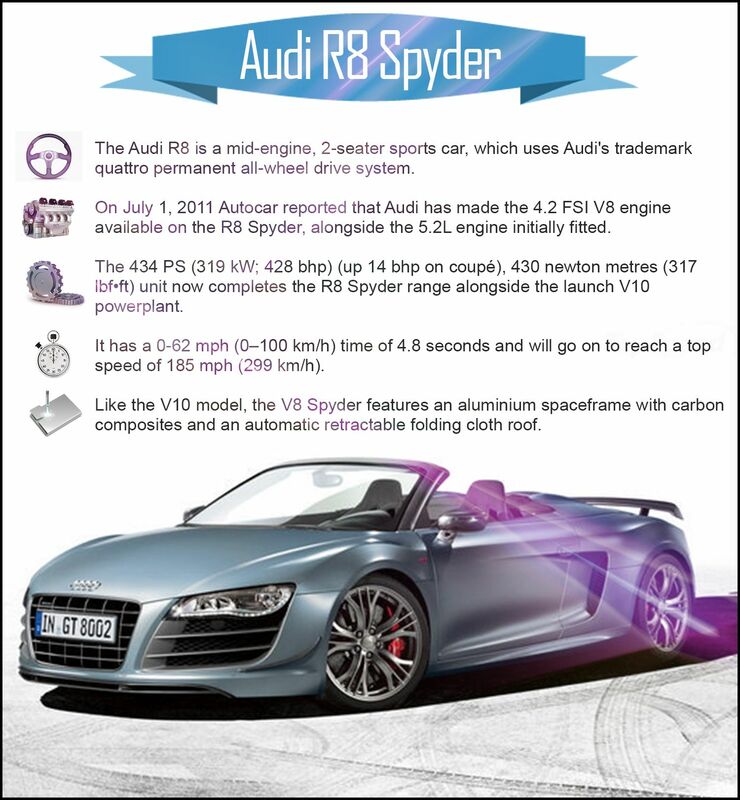 As a prestige sports vehicle, low running costs were not the highest priority when Audi created the R8 Spyder. While it is slightly more economical in terms of fuel consumption than the V10, it still only gets 19.9mpg and is in the highest band for road tax. If fuel efficiency and low running costs are what you look for in a car then this is not for you. However, the appeal of the R8 is that it performs on a par with a Ferrari, yet as part of the huge Audi dealership network will attract lower maintenance costs than rivals such as Ferrari, Porsche, Maserati or McLaren. Audi has a reputation for creating come of the nicest interiors on the market and in this regard the R8 does not disappoint. With heated seats on both the driver and passenger side combined with sports suspension, sitting behind the wheel for hours has never been more comfortable. This model features a sporty dashboard focused on the driver, crafted from quality materials and so far unique in the Audi range. The folding fabric roof when up does a surprisingly good job of keeping noise out and warmth in and it drops at the touch of the button to allow you to feel the wind in your hair and listen to that distinctive Audi engine. As with most two-seater sports cars, luggage space at a premium with a 100l boot capacity. However, Audi do sell tailored luggage that slots behind the seats to make the most of every inch of space, so this might be worth looking into if you plan on taking your R8 for weekends away. Overall the Audi R8 Spyder 4.2 V8 Quattro easily rivals more expensive counterparts such as the McLaren 12C or the Ferrari 458, losing very little in terms of performance and coming in at many thousands of pounds cheaper to boot. Check out the Acklam Car Centre website to stay up to date on all the latest arrivals to find yourself a quality used R8 and experience the excitement of driving your very own performance super car. If you’re want to make driving easier, read on, as this week Acklam Car Centre reveals five driving apps you need to download for android. Listen to the Smooth, Dulcet Tones of the Voice Coming Over the Sat Nav. As a family-owned provider of quality second hand cars, Acklam Car Centre has stood and watched as the world of driving has changed. New technologies have made driving even easier than ever! Case in point. Where once, the person in the driver’s seat would be left fumbling with a gargantuan fold away map to find their way, now all they need to do is listen to the smooth dulcet phones of the voice coming over the Sat Nav. Drive Gain: For nothing at all, you can download DriveGain; an app designed to help you save fuel whilst you drive. Use the app’s audio and visual feedback to cut fuel usage in transit, improve efficiency and save money. Tom Tom: You’ve guessed it, there’s now a Sat Nav app, meaning you don’t have to pay an exorbitant amount to find your way along the UK’s roads. It may be £50, but compared to an actual Sat Nav, you’ll make a real saving and never get lost again! Witness Driving: Pay a paltry 69p and gain ownership of a Witness Driving app. This app turns your phone into a video camera, to record footage of any accidents you have on the road, giving you evidence you can use in an insurance claim. Glovebox: An app like this is definitely one for the driver with the unordered mind. It works like a glovebox, because it provides an easy to access and modify directory for your cars data i.e. tax insurance and MOT reminders. Pay a mere 69p and never struggle to find your cars information again! JamCam: This one will be the answer to all your prayers. For absolutely nothing at all, you can get an app that gives you live traffic feeds for over 105 of the country’s most hectic motorways and A Roads. Use it to ensure you never get stuck in a traffic jam again! And there you are; these five apps will make driving so much easier for android users, but Acklam Car Centre would ask you to remember that there are far more out there, and you should check them out to make your life in the driver’s seat just that little bit easier. Following a number of recalls, GM has announced this week that they are to introduce hands free driving, which Acklam Car Centre thinks could revolutionise the industry. To be a provider of first rate second hand cars like Acklam Car Centre, is to find emerging car technology fascinating, The changing nature of the world in which we live, is quickly redefining the way we drive, altering the face of the global car industry. One of the most exciting technological trends in cars right now is the rise of the self-driving car. This innovative technology is changing the way we think about driving. That is why it is no surprise that GM have jumped on the bandwagon, with the introduction of hands free driving. According to Yahoo News UK, Mary Barra, CEO of General Motors, unveiled the plan last Sunday. Essentially, it will see the introduction of hands free technology to GM vehicles to make driving them safer, following a number of embarrassing recalls for GM this year. In speaking out about the move, Barra revealed that this new technology will be available to customers outside of the US as well. With demand high in China and Europe – due to the increasingly heavy toll of GM related accidents – this is move that is sure to be welcomed. Well, Acklam Car Centre certain hopes so. It’s been a bit of a nightmare year for GM drivers, with a number of recalls due to safety issues. Hopefully, the move towards hand free technology will once again make it a good idea to buy GM vehicle!